How much is a cheese sandwich? Where exactly is Baltimore-Washington International Airport? And who is this new ‘Icelandic Michael O’Leary’ chap? Wow Air staff seem like good craic, if their Facebook is anything to go by. AS YOU MAY have heard, we’ll all soon be able to trot off to Boston for rock bottom prices, thanks to a little-known Icelandic airline. Wow Air announced its new Dublin – North America routes this morning. The no-frills airline is offering one-way fares for as little as €149. The flights — from Dublin to Boston and Washington — will include a stopover in Reykjavik, and will operate only three days a week. So what can we expect from this ‘Icelandic Ryanair’ when the new service starts, later this year? And will we have to pay for a cup of coffee? Boston and Washington you say? To main airports, or will I be landing on some godforsaken airstrip in the next state? It’s to proper airports — Logan International Airport, and Baltimore Washington International, which is only marginally further from the city compared to Dulles (but very close to Baltimore, if you happen to be on a The Wire-inspired trip to the city). And this €149 business? Does that include taxes and everything? Yes. Yes it does. Although ‘restrictions and baggage fees may apply’. So if you’re happy to head to Boston with a small backpack — yes, looks like it could just cost you around 300 quid. How long will that be offered? Not forever, I imagine? “It is definitely an introductory offer,” CEO Skúli Mogensen told us earlier. However, I can also say that we continuously try to offer and lower our fares for the benefit of our customers. So yes, I think you can see very aggressive pricing coming into the transatlantic markets going forward. Right. So this Icelandic stopover… What’s the deal with that? 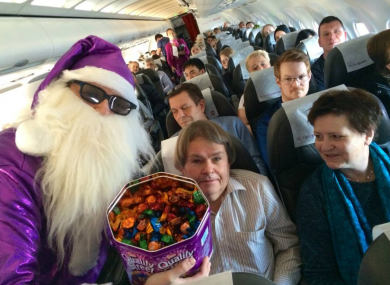 The Reykjavik stop-off is the airline’s secret weapon, as far as Wow Air is concerned. The fact that it’s two short-haul hops rather than one longer journey means they can use smaller, more fuel efficient planes (hence the low fares). Stop-overs will generally be for two hours outbound, and about 2 hours 20 minutes on the way back, we’re told. And it’s definitely ‘no frills’ is it? And while we’re here — who the hell are ‘Wow Air’ anyway? Good question. It’s a relatively small, relatively new company, founded in 2011 by Icelandic entrepreneur Skúli Mogensen. The 46-year-old (below) describes himself as an “accidental airline owner” and previously headed-up a mobile software company ‘OZ’ which he sold to Nokia in 2008. When do flights start? How can I find out more? All we know so far is that the flights get under way in October. And here’s the airline’s website. Email “How long will that €149 fare last and other important questions for 'WOW air'”. Feedback on “How long will that €149 fare last and other important questions for 'WOW air'”.